AVStoMPEG is a tool for video cutting, filtering and encoding. It uses Avisynth for the cutting, filtering and the audio encoding part and optional HC-Encoder, x264 or CINEMA CRAFT® Encoder for video encoding. It provides a graphical user interface for the Avisynth fil filters, for the video and audio encoding settings, a scenes-list shows you a lot of information about the scenes of your project, e.g. from which source the scene is, source video properties, destination video properties or your notice about the scene, a video preview with the possibility to compare the filtered video with the original video or two different filter chains, a bitrate calculator and a lot more. You can easily save a project and encode selected scenes from different sources as single videos or e.g. a complete video with scene transition effects. With the Avisynth filters you have the possibility to enhance nearly any thinkable bad video source. You can also import complete Avisynth scripts or write portions of a script. Beside this, you can save your filter chains as presets, so you can use them for other projects, too. Video sources can be: *.264, *.3gp, *.avc, *.avi, *.flv, *.H264, *.m1v, *.m2t, *.m2ts, *.m2v, *.m4v, *.mkv, *.mov, *.mp4, *.mpeg, *.mpg, *.mpv, *.mts, *.tp, *.ts, *.trp, *.vob, *.wmv. Image Sources can be: *.bmp, *.jpg, *.png, *.tif, *.tiff. 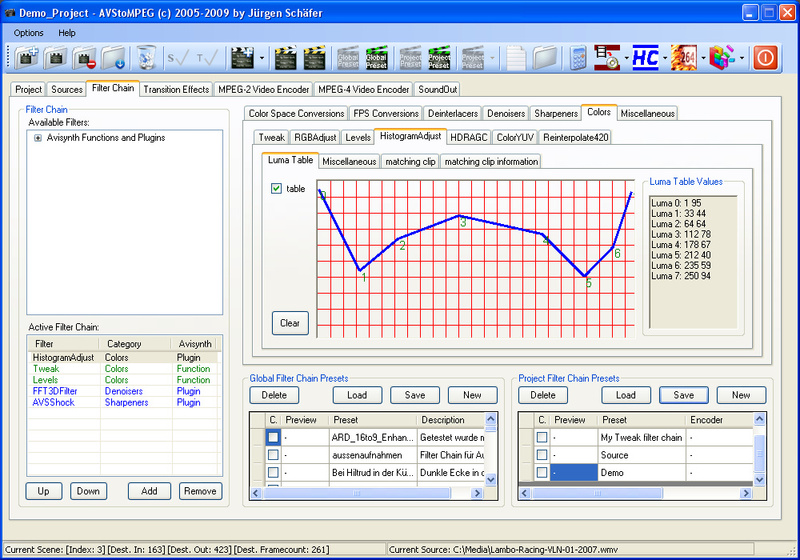 The following types of audio files can be used as input source (together with the video source): *.aac, *.ac3, *.aiff, *.ape, *.au, *.bwf, *.caf, *.dts, *.flac, *.lpcm, *.m4a, *.mpa, *.mp1, *.mp2, *.mp3, *.ogg, *.raw, *.rf64, *.wav, *.wma, *.w64, *.wv. Video output files can be saved as MPEG-2 or MPEG-4 H.264 files. 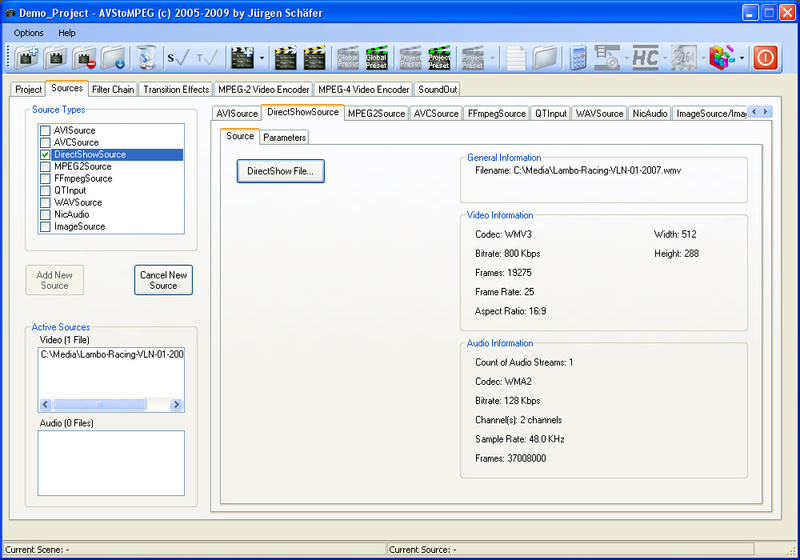 Audio output files can be saved as ac3, wav, mp2, mp3, FLAC, ogg and WavPack. The MPEG-2 Video Encoder tab. 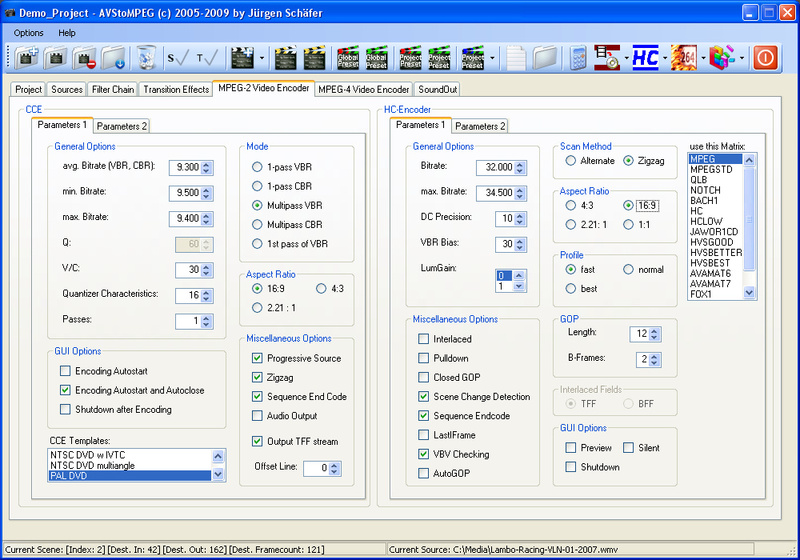 This tab provides an interface of two MPEG-2 encoders: HC-Encoder and CCE1 (Use one of them.). Here you can adjust the encoding parameters for your project. 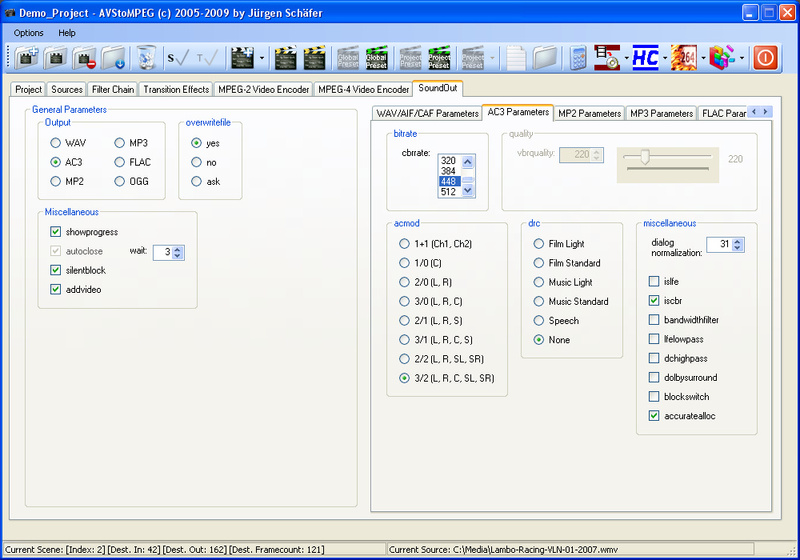 You can also load external files, which contain the encoder settings (ecl files for CCE and ini files for HC-Encoder).